How would you evaluate a flare V-groove joint for welder qualification to AWS D1.1? D1.1 is not clear on how to test the prequalified joint (B-P11-GF) for welder qualification. If you take a look at AWS D1.1 Clauses 4.25 and 4.28 you’ll see that D1.1, for Personnel Qualification states that a Complete Joint Penetration (CJP) qualifies a Partial Joint Penetration (PJP) groove. A Flare V- (and Flare Bevel) is a PJP. 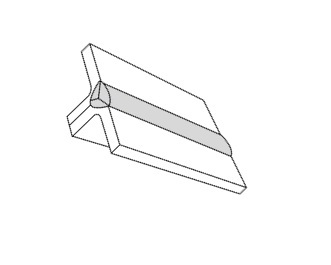 Typically you would use the V- and Bevel Groove, CJP configurations laid out in Clause 4 for Groove Welding Personnel Qualification. That’s not to say I would never use a Flare V- Groove for Personnel Qualification. If Flare V- Grooves were a concern of mine, I would design a Workmanship Sample requiring the welder to complete the Flare V- Groove to my Weld Procedure Specification (WPS). Then I would cut and etch it (usually at 3 locations) to evaluate size [(E)=3/4r, see B-P11-GF]. So I guess, long story short, you would always use a CJP Bevel or V- Groove for Personnel Qualification of Grooves (CJP or PJP) and you would only use a PJP as supplemental to verify size. Thank you for answering my question, your input clears up some of my confusion. I have a customer that is doing welder performance qualification to prequalified material and prequalified weld joint B-U4a-GF. Looks as though weld joint B-U4a-GF will also qualify PJP flare bevel tubular according to Clause 4.25 and 4.28. Don't hesitate to write again.